I did something sensible. Yes, I know, those who have spent any time with me will be saying ‘that’s somewhat uncharacteristic’ etc. My sensible act was filling in a very detailed risk assessment for my upcoming St St project. After doing so I decided that there was no way I could use the mission department’s inflatable church. The weather forecast predicted that if I did, not only would it be inflatable but it would also be flying like a hot air balloon. I must admit I was gutted. I was looking forward to having a prayer station on the street in an inflatable church building. so, what to do instead? All week i couldn’t get out of my head the old song about the fruit of the spirit. The reason for this is that during my pastor’s preach at Biggleswade the previous sunday, Phil Campion asked us whether any of us knew what the fruit was. The way I always remember the different parts is through singing the song in my head. Having quickly gone through the song a couple of times I was just about to shout them out when someone calmly volunteered the answer. Yet it got me thinking. Could these amazing gifts we ‘get’ from God when we are reconciled to him and grow in our faith also be lavishly available to those who have no faith or another kind of one? Or to those who are indifferent or haven’t heard the good news of Jesus before? I decided that this fruit was a wonderful ‘advert’ of what we can have ‘more of ’ from God. Instead of the amazing inflatable church I would simply offer these gifts and represent them through becoming a fruit market stall evangelist for a sunday morning. 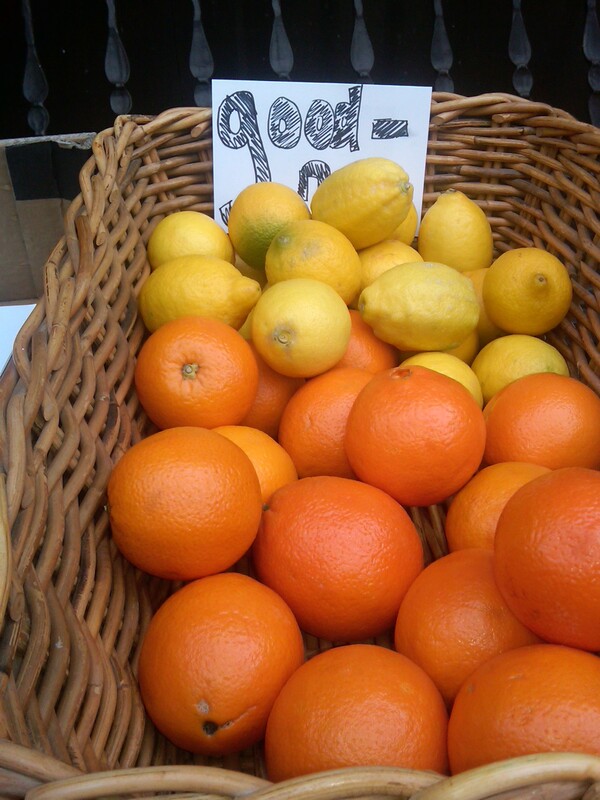 On my stall I had nine different sorts – apples, plums, pomegranates, bananas, lemons, oranges, pineapples, melons and kiwis. With each one I made a sign, love, joy, peace, patience, kindness, goodness, faithfulness, gentleness and self-control. 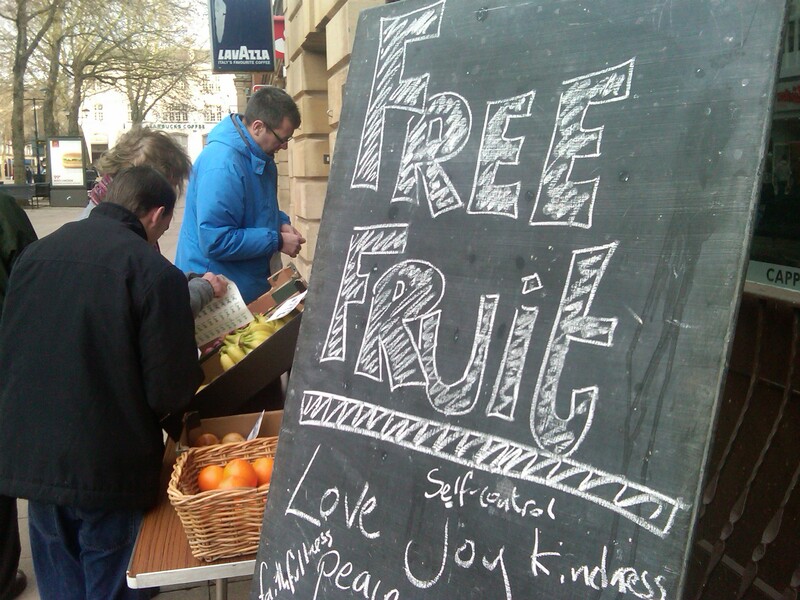 As soon as I had put up the ‘Free Fruit’ sign we had a steady stream of customers. I was struck by how many people connected with what we were doing. some people commented that they needed more peace so they asked for an apple with a label on it that stated ‘peace.’ Others just filled their arms with as much fruit as they could carry and happily went on their way with a smile on their face. Most of all, people connected with the gesture and were just chuffed to receive a piece of fruit for free. Two people broke down in tears as I and my small team of volunteers spoke with people about what we can have from God. One lady said that she needed to know that she was loved and wept as we prayed for her. This idea is so simple. It has got me rather excited. In what way could we bring the teachings on grace, forgiveness and peace (the kind of stuff we learn in the church building) to people out there in public places? I have to tell you, Chris, that Jesus approves of what you are doing. I mean, he really, really loves the stuff you do. He often told stories to illustrate spiritual principles and you are using objects to do the same thing; they’re physical parables. You really are being the light in the world. After all the One who is the Light of the World is living in you. The Spirit of Christ is in you. now that’s what I call encouraging.